It is very gratifying to state the situation for Illinois. 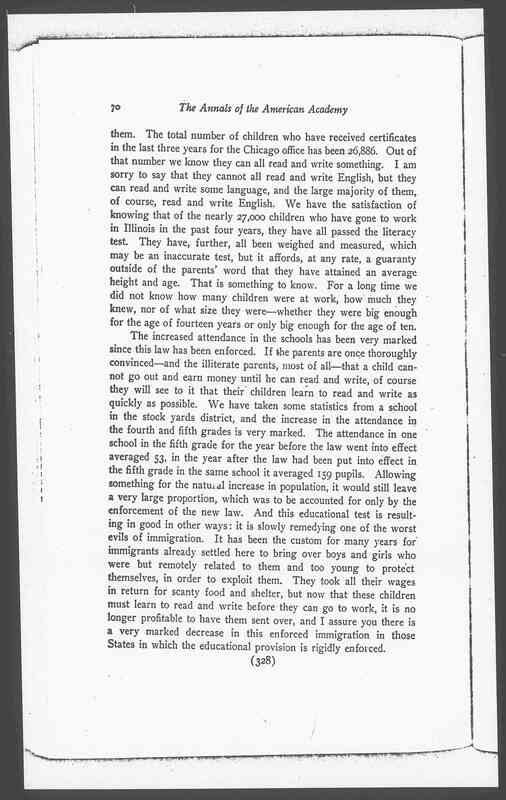 For while in the nation as a whole child labor is growing, -- that is, we are having each year in America more children at work than was true of the previous, -- we are able to say that that statement is not true of Illinois. There has been a decided decrease in Illinois, in the number of children at work during the last four years. Notwithstanding the annual increase in the population, and in spite of the fact that our manufacturers are increasing, we have a very decided decrease in the number of children working both actually and proportionately. 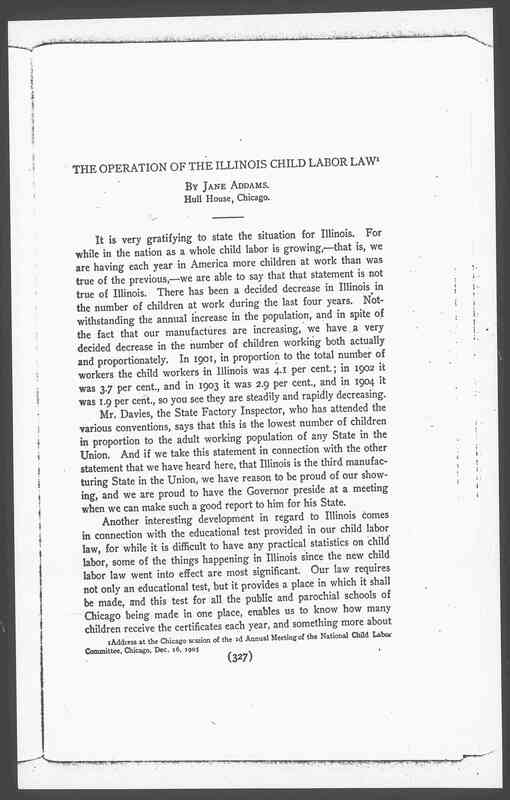 In 1901, in proportion to the total number of workers the child workers in Illinois was 4.1 per cent. 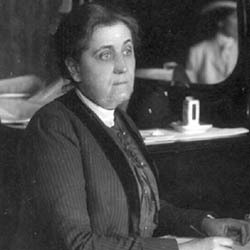 ; and in 1902 it was 3.7 per cent., and in 1903 it was 2.9 per cent., and in 1904 it was 1.9 percent., so you see they are steadily and rapidly decreasing. 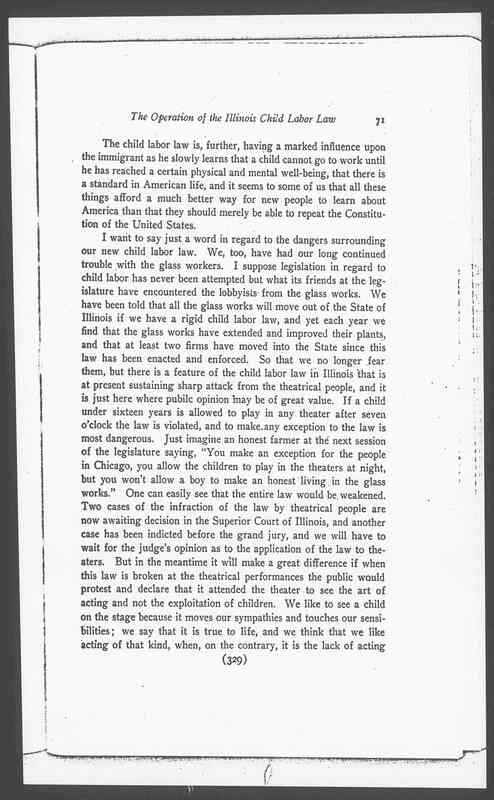 Mr. Davies, the State Factory Inspector, who has attended the various conventions, says that this is the lowest number of children in proportion to the adult working population of any State in the Union. 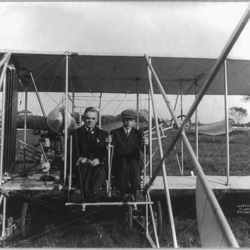 And if we take this statement in connection with the other statement that we have heard here, that Illinois is the third manufacturing State in the Union, we have reason to be proud of our showing, and we are proud to have the Governor preside at a meeting when we can make such a good report to him for his State. 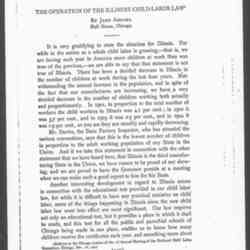 Another interesting development in regard to Illinois comes in connection with the eduational test provided in our child labor law, for while it is difficult to have any practical statistics on child labor, some of the things happening in Illinois since the new child labor law went into effect are most significant. 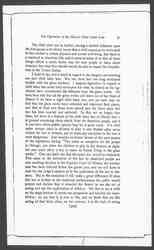 Our law requires not only an educational test, but it provides a place in which it shall be made, and this test for all the publc and parochial schools of Chicago being made in one place, enables us to know how many children recieve the certificates each year, and something more about [page 2] them. The total number of children who have recieved certificates in the last three years for the Chicago office has been 26,886. Out of that number we know they can all read and write something. I am sorry to say that they cannot all read and write English, but they can read and write some language, and the large majority of them, of course, read and write English. We have the satisfaction of knowing that of the nearly 27,000 children who have gone to work in Illinois in the past four years, they have all passed the literacy test. 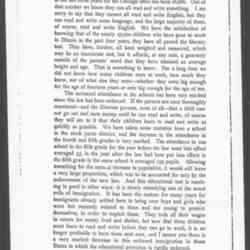 They have, further, all been weighed and measured, which may be an inaccurate test, but it affords, at any rate, a guaranty outside of the parents' word that they have attained an average height and age. That is something to know. For a long time did not know how many children were at work, how much they knew, nor of what size they were -- whether they were big enough for the age of fourteen years or only big enough for the age of ten. 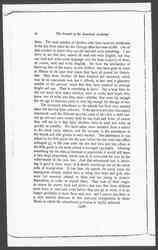 The child labor law is, further, having a marked influence upon the immigrant as he slowly learns that a child cannot go to work until he has reached a certain physical and mental well-being, that there is a standard in American life, and it seems to some of us that all these things afford a much better way for new people to learn about America than they should merely be able to repeat the Constitution of the United States. I want to say just a word in regard to the dangers surrounding out new child labor law. We, too, have had our long continued trouble with the glass workers. I suppose legislation in regard to child labor has never been attempted but what its friends at the legislature have encountered the lobbyists from the glass works. 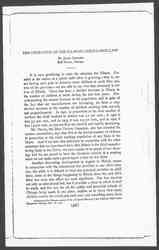 We have been told that all the glass works will move out of the State of Illinois if we have a rigid child labor law, and yet each year we find that the glass works have extended and improved their plants, and that at least two firms have moved into the State since this law have been enacted and enforced. 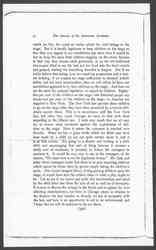 So that we no longer fear them, but there is a feature of the child labor law in Illinois that is at present sustaining sharp attack from the theatrical people, and it is just here where public opinion may be of great value. If a child under sixteen years is allowed to play in any theater after seven o'clock the law is violated, and to make any exception to the law is most dangerous. 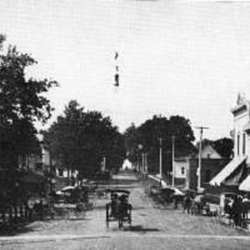 Just imagine an honest farmer at the next session of the legislature saying, "You make an exception for the people in Chicago, you allow the children to play in the theaters at night, but you won't allow a boy to make an honest living in the glass works." One can easily see that the entire law would be weakened. 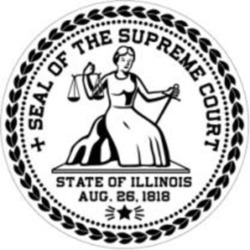 Two cases of the infraction of the law by theatrical people are now awaiting decision in the Superior Court of Illinois, and another case has been indicted before the grand jury, and we will have to wait for the judge's opinion as to the application of the law to theaters. But in the meantime it will make a great difference if when this law is broken at the theatrical performances the public would protest and declare that it attended the theater to see the art of acting and not the exploitation of children. We like to see a child on the stage because it moves our sympathies and touches out sensibilities; we say that it is true to life, and we think that we like acting of that kind, when, on the contrary, it is the lack of acting [page 4] which we like, the touch of reality which the child brings to the stage. 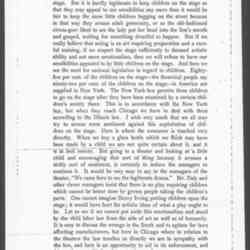 But it is hardly legitamate to keep children on the stage so that they may appeal to out sensibilities any more than it woul be fair to keep the same little children begging on the street because in that way they arouse adult generosity, or as the old-fashioned circus-goer liked to see the lady put her head into the lion's mouth and gasped, waiting for something dreadful to happen. But if we really believe that acting is an art requiring preperation and a careful training, if we respect the stage sufficiently to demand artistic ability and not mere emotionalism, then we will refuse to have our sensibilities appealed to by little children on the stage. And here we see the need for national legislation in regard to children. Eighty-five per cent. of of the children on the stage -- the theatrical people say ninety-two per cent. of the children on the stage -- in America are supplied in New York. The New York Law permits these children to go on the stage after they have been examined by a certain children's society there. This is in accordance with the New York law, but when they reach Chicago we have to deal with them according to the Illinois law. I wish very much that we all may try to arouse some sentiment against this explotation of children on the stage. Here is where the consumer is touched very directly. When we buy a glass bottle which we think may have been made by a child we are not quie certain about it, and it is at best remote. But going to a theater and looking at a little child and encouraging that sort of thing because it arouses a sickly sort of sentiment, is certainly to induce the managers to continue it. It would be very easy to say to the managers of the theater, "We came here to see the legitamate drama." 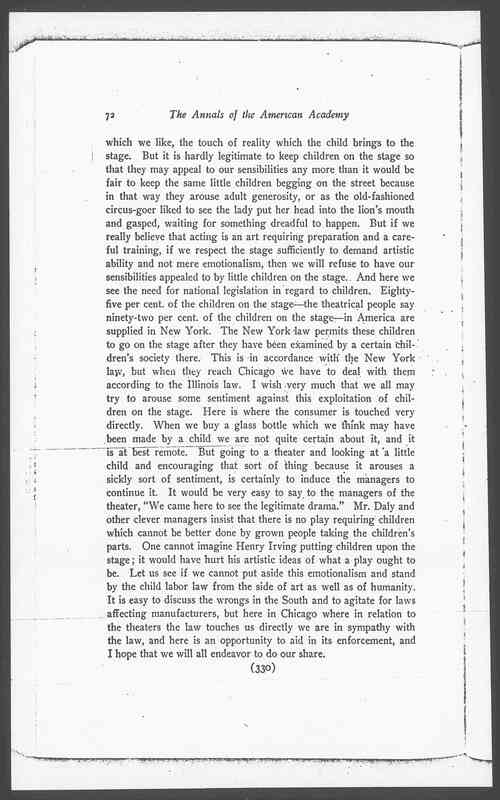 Mr. Daly and other clever managers insist that there is no play requiring children which cannot be better done by grown people taking the children's parts. 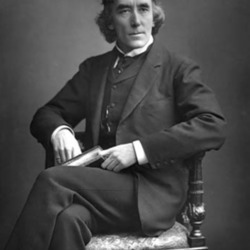 One cannot imagine Henry Irving putting children upon the stage; it would have hurt his artistic ideas of what a play ought to be. Let us see if we cannot put aside this emotionanalism and stand by the child labor law from the side of art as well as of humanity. 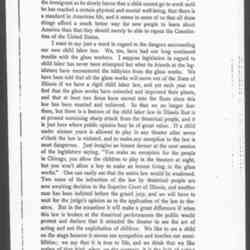 It is easy to discuss the wrongs in the South and to agitate for laws affecting manufacurers, but here in Chicago where in relation to the theaters the law touches us directly we are in sympathy with the law, and here is an oppurtunity to aid in its enforcement, and I hope that we will all endavor to do our share. 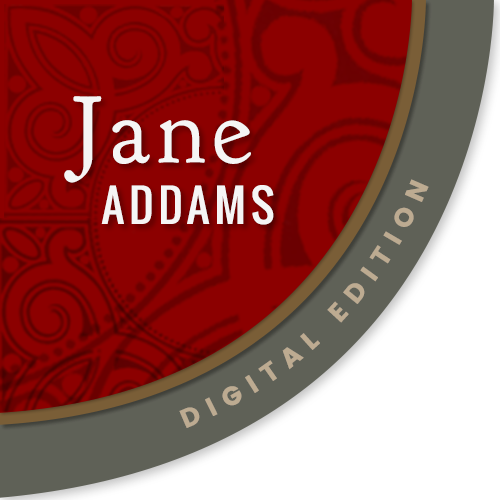 Addams, Jane , “The Operation of Illinois Child Labor Law, December 16, 1906,” Jane Addams Digital Edition, accessed April 22, 2019, https://digital.janeaddams.ramapo.edu/items/show/4229.